Back in December I blogged about an upcoming exhibit that I was excited to see, the photography of Miroslav Tichý at the International Center of Photography (ICP) in NYC. Tichý is a Czech photographer with a fascinating history. You can read more about him in my earlier post and at Tichy Ocean. 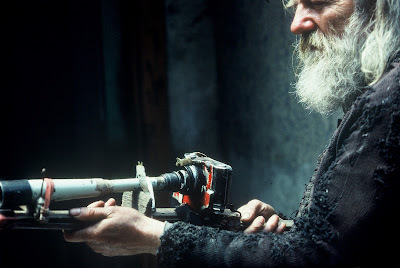 What totally captivated me were his cameras, completely hand constructed from found objects! No photography was allowed at the gallery and for this post, pictures were provided by Foundation Tichy Ocean or shot from post cards bought at the show. Perhaps there is irony to be found in the fact that one cannot take photos of a photography exhibit!! The exhibit did not disappoint. Although small in scope, the exhibit is well worth a visit. From the exhibit - "His photographs are sensual objects, artifacts of a deliberately abusive production process in which injury and distress are not only allowed but considered philosophically." "Like a gleaner, he moves through the city, collecting the small moments that others might ignore or overlook." His photographs were often framed with "a deliberate awkwardness, a denial of perfection." 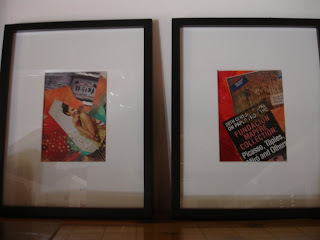 Sometimes mounted on old book covers, paper, or cardboard, his frames were styled with hand drawn lines - sometimes simple and at times quite ornate. 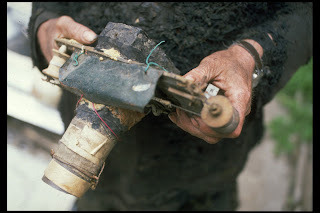 As part of the exhibit, there were two huge glass tanks filled with the "debris" of his career: cameras, film, piles of old photographs, books, leather camera cases, lights made from tin cans, old wooden frames, drawings, and pairs of glasses with bits of metal strands used as ear pieces. For me, these were the best part. This exhibit runs through May 9th. 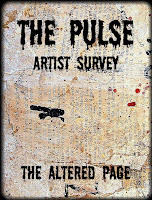 Welcome to the fourth edition of The Pulse -- The State of the Art -- a survey in words and pictures of the online artist community. Nearly 150 artists have answered a list of questions which make up The Pulse. Their responses will be presented as a series of online and print projects. 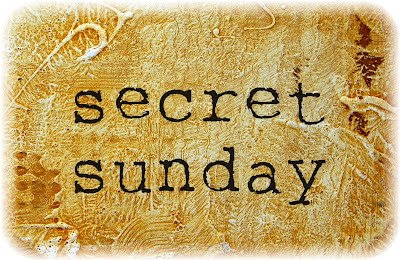 Secret Sunday was the first project and the links to all the secrets can be found on the sidebar of my blog. The Book Guild is the second project and begins right now! To celebrate both the opening of The Guild and my 200,000 visit, I have been holding a giveaway of 5 art books. And today, 5 lucky people who were randomly picked will each add 1 art book to their personal library. Thanks to everybody who played - all 289 of you! Congratulations to all of you. Please email me with your address so that I can mail out the books to you. And for those of you who did not win, no worries...there will be more giveaways on The Guild soon. Of the 5 books I included, Diana Trout's book Journal Spilling was the most frequently requested in the giveaway. 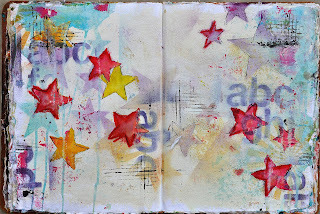 North Light: Would you be interested in writing a book about art journaling? Me: Hopping in my socks (after my shoes were blown across the room) YES! The premise of Journal Spilling came about in a very organic way. That is the way I work: just by starting and letting everything spill out until I get to the heart of it, that little nugget of truth that needs to be in the high beams. The six months before the photoshoot, was spent in the process of making the art and coming up with the projects: stretching and challenging myself. I kinda did what I always do: moodle around with materials until an idea begins to emerge then jump on that galloping horse and make the art (except times 10!). Since I work with very little planning, this was a sticky bit for me because I needed to remember to record what I was doing without interrupting the flow of ideas. My inner engineer (aka Stewie) came up with a couple of systems to help me with this part. Sticky notes really are brilliant! I was pretty nervous going out to Ohio for the photoshoot, but it was a blast. My editor and the photographer were so professional and friendly. What a great team, full of thoughts, observations and ideas. I felt really comfortable with them and all the folks at F&W. It was definitely weird though having people watch me work and take notes. Yikes. Who are my readers? Where are they coming from? What may they need to hear? You see, it needed to be real. It needed to be honest. My mission was to give my readers the freedom to make their own art; to use the techniques and projects in Journal Spilling as a springboard. It was pretty much a six week writing marathon. The final form of Journal Spilling was hearing from folks that they love the tone, projects and inspiration of Journal Spilling. That they needed a little push, and they got it from this book. Mission: accomplished as well as we could at that moment in time. The gallon or two of sweat along the way was worth every drop. Thanks Diana for spilling out your heart to all of us, in both your book and in this post. Journal Spilling can be purchased here . And you can visit Diana on her website, on her blog, or at her Etsy shop. As members of The Book Guild, I hope you will comment on this post to get the conversation going. Feel free to talk about Journal Spilling if you have a copy. And if you have created any journal pages or artwork based on Diana's book projects, please leave a link in the comments so we can all see. Next meeting of The Book Guild - Sunday April 4th. Mark your calendars! The drawing for and posting of my blog giveaway will take place this Sunday March 28th. If you haven't signed up for a chance to win, leave a comment on this post and tell me which of the following five books you would most like to receive. But hurry, because you only have till the end of today to enter. The drawing will coincide with the first day of The Book Guild. Beginning March 28th, The Book Guild will meet on my blog every Sunday. Come for links, book reviews, giveaways, interviews with many of your favorite authors, and a few surprises. And come for the discussion that is an integral part of any book club. Hope to see you there! Recently I was lucky enough to have the opportunity to attend a workshop given by Keith Lo Bue. His profile on his blog states that he is a "found-object jeweler and sculptor" but his work really defies labeling. The workshop was called Papering Over It - Collaging the Found Object. 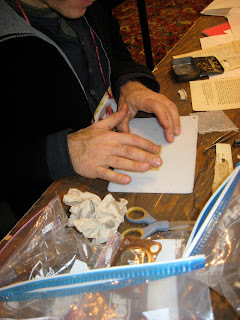 Much of Keith's work is oriented toward jewelry design but this technique-driven workshop was like hitting the jackpot for mixed media as well. I cannot recommend his classes more highly. Keith has been working for many years and has discovered and created such unique techniques all his own. His creativity is only exceeded by his generosity. He seemed to be sharing all his secrets. And, simply put, he is a nice guy too. I had a chance to learn and try out many techniques in the workshop that I know will find their way - as translated by my own voice - into my artwork. Of the many things I learned, a paper wrapping technique was one of my favorites. The photos in this post highlight the practice piece I made in the workshop using this process. The workshop was made even better by that fact that I shared a table with Jill from JazWorks and finally had the opportunity to meet &rew from Urban Paper Arts. In addition, Thomas Mann was teaching within the same space and after meeting him, I realized that I would love to take a class from him in the future. Keith will be teaching again this year in both the USA and in Australia. Check out his website (one of my favorite's in terms of design) and blog for more information and to see his art. Over 150 (!) artists have answered a series of questions which make up The Pulse. Their responses will be presented as a series of online and print projects. And the first continues right now! If you have missed any, no worries. You can find links to all the secrets on the sidebar of my blog. My latest secret is Global Art Handmade Watercolor books....they're fantastic to journal in and they're worth every single penny you pay for them. I use a lot of pigments - metallic and otherwise. My absolute favorite is Doc O'Brien's Weathering Powders - I mix these with paints, inks, acrylic matte glaze and even water. Because it is self adhering, I also use it all by itself with a paint brush (on non-wearable pieces only). It comes in so many colors and the only place that sells it is Micro Mark. 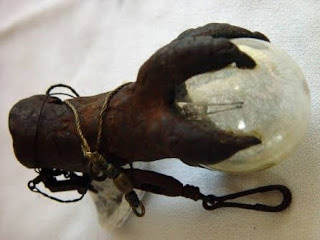 Here is a photo of "Charley's Claw" which is just made of polymer clay and an old camera flash bulb. I think it looks so much better because of the Weathering Powders. Ooooo…. I like art secrets! Mine… hmmmm….. I would say finding the *right* pen is BIG on my list. I think I’ve tried every pen under the sun… and always come back to using the Uniball Vision Elite in black. LOVE. THIS. PEN. It writes over paint, pastels, etc. without issue! Also, Elmer’s Painters! They are THE. BEST. PAINT. PEN. EVER! I know that many folks swore by the now nearing extinction Sharpie Paint Pen, but this one is SUPERB! There are different tips available, and depending what I am doing depends on my choice. For my art journaling I use the ultra fine points, but for my handwriting over acrylics I almost always go for the bigger tips. These things rock! 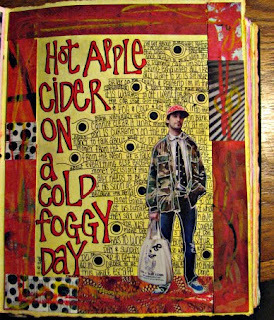 Here is an example of writing onto images in an art journal. Baby wipes - use them a lot in my artwork and cannot live without them :) Do lots of scrubbing and distressing with them. A recently discovered art “secret” is the use of a product called NEVR-DULL Magic Wadding Polish. It is made for polishing automobile chrome, or silverware, and you buy it at a hardware store. The product is cotton wadding impregnated with a metal polishing agent, and comes in a dark blue can which costs about five dollars. This is how I use it: Take any printed image from a magazine or other source (incidentally, black and white or color copy machine images do NOT work), such as National Geographic, old postcards, pictures from books, etc. Over areas that you wish to preserve in their original color and brightness, brush on two (or more) layers of acrylic (polymer or matte) medium, allowing the first coat to dry before applying the second. When the acrylic medium is completely dry take a small wad of the Nevr-Dull material out of the can, and rub it on to the surface of the image. You will notice that the polish in the wadding material soon begins to make the unprotected portions of the image (those not covered with acrylic medium), fade and begin to disappear. You can easily control how much the image “fades” by how much pressure you apply, and the length of time that you apply it. If you want a slightly more textured image, you can squeeze Elmer’s glue directly on the image, in place of the acrylic medium. It works equally well, and gives a different look to the image. The only negative in using Elmer’s glue is that since the glue is much thicker than acrylic medium, it takes considerably longer to dry, before you can rub the image with the Nevr-Dull wadding material. 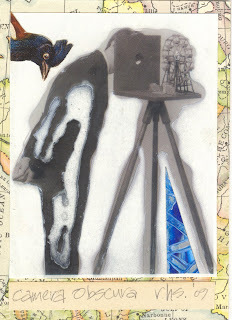 This is an ATC I created using it. The white areas, both inside and outside the figure, and around the camera and tripod, are the areas that were unprotected, where the impregnated cotton wadding was used. The remaining black, white, and gray image (man and camera), were protected from fading/disappearing with (in this case), Elmer's glue. The elements with color, were attached, later. It's a fun product to use, however it has a very strong odor, and needs to be used in a room with very good ventilation. Also, used cotton wadding material can be kept from drying out (and from being an odor problem), by placing it in a small ziplock bag for reuse, later. My only art secret is Perfect Paper Adhesive. 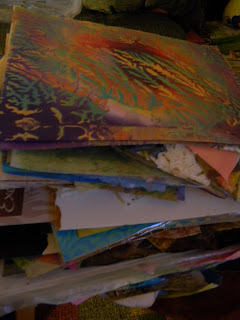 It does everything Mod-Podge does, but does not feel tacky when dry. It comes in flat and gloss. Photography: Whenever I visit a Starbucks, I take pictures of the art and wallpaper, that is always there. I like to use these pictures and combine them with my own ones for digital collages. Today is the last day of Secret Sunday. A big thank you to each and every one of you for spending the last 18 Sundays with me. And Sundays at The Altered Page continues uninterrupted next week. Stop by and join The Book Guild, premiering here next Sunday March 28th! I want to thank every one who has visited my Etsy shop. How cool is it that we now have an infinite number of art stores that are open to us 24/7/365! Think of this post as a flyer, slipped under your door. Or the photocopy that has been stapled to the ultility pole on Main Street. Or an insert in your Sunday papers. I have just restocked copies of my zine based on the third edition of The Pulse, originally completed in 2008. This will be the last printing that I will sell online. You can read all about the contents here. I will add additional copies to the Etsy listing as they sell. There are only 11 copies left for purchase. I am running very low on these brass Xs, my first set of Etsy Elements. These are sold in sets of five and I have only 1 more set of hand verdigris Xs and 2 sets in your choice of their natural brass state or with a hand distressed, darkened finish. I am going to try to hunt more down, but as of now these 3 sets are the last available. All Xs sold out. Thank you! My next set of Etsy elements will be listed soon. This photo is a preview of what is to come. I call them Droplets. Please check my sidebar in the coming days to see when they are available for purchase. Four pieces from my Melt series remain. These are all original, mixed media artworks made using coffee grounds and combining a deep chocolate brown with a rich, dark blue. And hand distressed of course. Inspire is the newest addition to my Etsy shop. Completed on watercolor paper, this green, black and white piece measures 4" x 2 3/8". Text, numbers, and symbols float above and below the surface. And bits of metallic acrylic provide a subtle sheen. Click here to explore The Altered Page on Etsy. Welcome to The Book Guild, the second project from The Pulse -- The State of the Art -- a survey in words and pictures of the online artist community. All artists participating in The Pulse were asked to name their favorite art books. In the end, there was a list large enough to create one amazing art library, especially since more than 40 of the artists responded with more than one favorite! The Book Guild will meet every Sunday, rain or shine. So stop by to be introduced to a whole new library of art-related books. The Guild will be more than just a list however. There will be links, book reviews, giveaways, and interviews with many of your favorite authors. And I promise you that there will be some major events that are guaranteed to knock your handmade socks off!! Like any good book club, there needs to be members. And that is where YOU come in. I am hoping you will participate by leaving comments related to the books in each post - for example thoughts, book reviews, personal experiences, or a link back to your own blog posts that include artwork based on a project in the listed books. So join the club and come to The Book Guild. And mark your calendars. The first meeting will be held on Sunday March 28th. See you there!